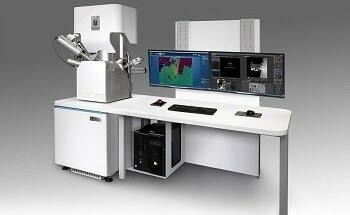 The TESCAN S8000G is a FIB-SEM system which has all that it takes to meet the demands of today’s research in both industry and academia; it delivers outstanding image quality with superb contrast ideal for nanocharacterisation and the capability to perform complex nanoengineering tasks with extreme precision and incomparable ease. 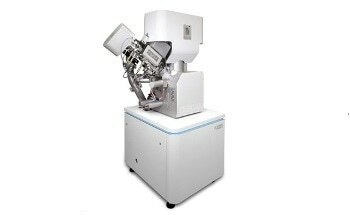 It is equipped with the new BrightBeam™ SEM column which achieves truly uncompromised field-free ultra-high resolution (UHR) for maximum versatility in analysis including the analysis of magnetic samples and live SEM monitoring during FIB operations. The new column is equipped with an electron optics design that improves resolution especially at low beam energies ideal for imaging beam-sensitive and nonconductive samples. 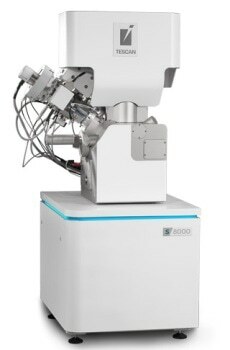 On the other hand, the synergy of the novel Orage™ Ga FIB column fitted with state-of-the-art ion optics and the newly designed OptiGIS™ gas injection system makes TESCAN S8000G a world-class instrument for sample preparation and nanopatterning. New detection system including In-Beam Axial detector and Multidetector for angle-selective and energy-selective signal collection gives complete control on surface sensitivity and the option to explore with different contrast for sharpening your senses and deepening your insight. Field-free ultra-high resolution imaging for maximum versatility in imaging and analysis including the analysis of magnetic samples and live SEM imaging during FIB operations. World-class quality in sample preparation with excellent performance at low energies for preparing damage-free ultra-thin TEM specimens. Novel Orage™ Ga FIB column for ultra-high resolution ion beam and excellent performance throughout the entire range of ion beam currents and full energy range down to 500 eV. Resolution < 2.5 nm at 30 keV.